Traditional systems of medicines developed in various parts of the world during different ages. A systematic shape was given to them in different ancient centres of civilization and culture. Some of these traditional systems are based on a rational and sound fundamental principles and some others have only an empirical base. Some of those traditional systems did not survive and have become subjects of history whereas others like the traditional system of medicine of India and China are not only surviving but also fully progressing with State patronage. The present book gives fundamentals of Ayurveda in clear and lucid style. Vaidya Bhagwan Dash in the course of over three. decades of dedicated research and practice of Ayurveda has written more than forty outstanding books on Ayurveda and TIbetan Medicines. The prophetic prayer of Sir Hutchison, the illustrious author of the well known work Clinical Methods- is more significant today than ever before. Splitting the body into finest particles, probing deeper and deeper into their functions. and finding remedies for correcting their morbidities have become the primary objective of modern medical research. In this process. the individual as a whole is getting lost. Ancient health science like Ayurveda, health-protector of humanity for thousands of years and store-house of human knowledge about health need to be studied carefully, examined scientifically and utilised diligently for the health-development of the individual and the society as a whole. Too much dependence upon laboratories, and less upon the clinical acumen has created a barrier in the physician-patient relationship. 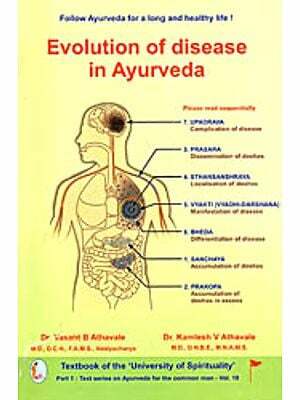 In ayurveda, simple methods are employed for the diagnosis of diseases; therefore it is economical. In addition, because of its availability, accessibility, acceptability, adaptability and dependability, there is a keen and sincere desire to know more and more about ayurveda both among the elite physicians as well as scientists, and common man all over the world. For the proper appreciation and correct application of ayurveda in the day to day health care, the knowledge of its fundamental principles is very essential. Therefore, a new edition of this work with revision of chapters, addition of new information and lucid explanations is presented before the august readers. Ku. Kanchan Gupta, M.A., M.Ed. was of great help in editing this work, and my daughter Ku. Pratima Dash helped in preparing the press-copy. May God bestow upon them good health, happiness and prosperity in life. Man has eternally endeavoured to keep himself free from three types of miseries, namely, physical, mental and spiritual. Therefore, the history of medicine is as old as the history" of mankind. According to Indian tradition, the four primary objectives of human life are : dharma or to perform religious rites, artha or to acquire wealth, kama or to satisfy the worldly desires, and moksa or to attain salvation. Good health was considered to be the sine qua non for the" achievement of these objectives. Traditional systems of medicine developed in various parts of the world during different ages. A systematic shape was given to them in different ancient centres of civilization and culture. According to Caraka, Ayurveda or "the science of life" had always been in existence and there had always been people who understood it in their own way. Some of these traditional systems are based on a rational and sound fundamental principles and some others have only an empirical base. Some of those traditional systems did not survive and have become subjects of history of medicine like the Greek medicine and the Egyptian medicine. Some others like the traditional system of medicine of India and China are not only surviving but also fully progressing with State patronage. Ayurveda. Unani, Siddha, Emchi (Tibetan) and Prakrtika cikitsa (Naturopathy) are the various traditional systems of medicine still prevalent in India. Yoga and Tantra which are primarily meant for spiritual attainments have also certain prescriptions for the prevention and cure of psychic, somatic and psycho-somatic ailments. Besides, several types of folk medicines are prevalent in different tribal areas of India. They have a rich tradition of me use of plants, minerals and animal products having therapeutic utility. Of the traditional systems of medicine in India, the practice of Ayurveda is prevalent in almost all parts of the country and its neighbouring countries like Nepal, Sri Lanka, Bangladesh as well as Pakistan. Unani Tibb which literally means Greek medicine, is popular in certain regions of the country which are dominated by Muslim population. The Siddha system of medicine is identified with Dravidian culture and it 0 is prevalent in the State of Tamil Nadu and some of its adjacent areas of the neighbouring States of South India having Tamil-speaking population. Emchi which is commonly known as the Tibetan system of medicine is popular in certain border areas of the northern India like Laddakh, Lahul, Spiti, Darjeeling and Sikkim. These areas have a common border with Tibet and China. Centres for the practice of Yoga, Tantra and Prakrtika cikitsa are located in different parts of the country. Tribal people mostly inhabit the forest areas of States like Orissa, Bihar, Madhya Pradesh, Andhra Pradesh and Rajasthan, and diffrent types of folk medicine are prevalent among these adivasis or tribal people. Both in theory and practice, there are many things in common use among these Traditional Systems of Medicine of India. Each one of them has given to and taken from the other. The medicines of one system are therefore, freely used by the practitioners of another system and these systems are not in water-tight compartments. However, Ayurveda which is the most popular among the people of India has a unique position among them. Definition of Ayurveda The word 'Ayurveda' is composed of two Sanskrit terms, viz., ayus meaning 'life', and' veda' meaning the' knowledge' and taken together, it means the 'Science of Life.' However, in a limited sense, it 0 is always used to imply 'the Science of Medicine'. Caraka has defined ayurveda as the Science through the help of which one can obtain knowledge about the useful and harmful types of life (hita and ahita ayus), happy and miserable types of life, things which are useful and harmful for such types of life, the span of life as well as the very nature of life." It will be seen from this definition that Ayurveda lays emphasis upon not only leading a life which is full of happiness, which implies an individualistic attitude but also leading a life which will be useful to society as a whole. Man is a social being. He cannot withdraw from society. Unless the society becomes happy, it will not be possible for the individual to attain or maintain his own happiness. It is with this in view that the individual should always make an effort to subscribe to the happiness of the society and ayurvedic texts are replete with references to the manner in which the society can be kept happy. The social medicine which is treated as a new concept in modern system of medicine is nothing but reminiscent• of what has been preached and propounded in ayurveda more than 2500 years ago.